Powell stars as ex-convict Rocky Mulloy, who’s been sprung from the pen after serving five years for a heist he didn’t have anything to do with. Mulloy’s easily one of the funniest denizens in noir I’ve come across. It doesn’t matter if he’s talking to a store clerk, a cop, or his landlord, he always ready with a put-down. Mulloy’s new-found freedom comes courtesy of a one-legged alcoholic Marine named Delong (Richard Erdman), who also possesses the gift of gab. Once free, Mulloy goes after the men who he believes did commit the heist. Not to clear his name, but to collect a debt from that nightclub owner, Castro (played by William Conrad of The Killers). Collecting his dough isn’t so easy with the fuzz tailing him in hopes that he’ll lead them to the money they’re still convinced he stole. That’s even the reason booze-fiend Delong gave a false testimony to free Mulloy – he thinks he’ll give him a cut of the money for doing him a favor. The two shack up together in a trailer park and while Delong drinks his days away, Mulloy puts the pieces together to get what’s coming to him and find out who framed him for the big heist. Through it all, Mulloy remains a steadfast crank, but deservedly so. He spent five years in the clink and has emerged a cynical, acid-tongued curmudgeon. In the words of Mulloy, wouldn’t you? 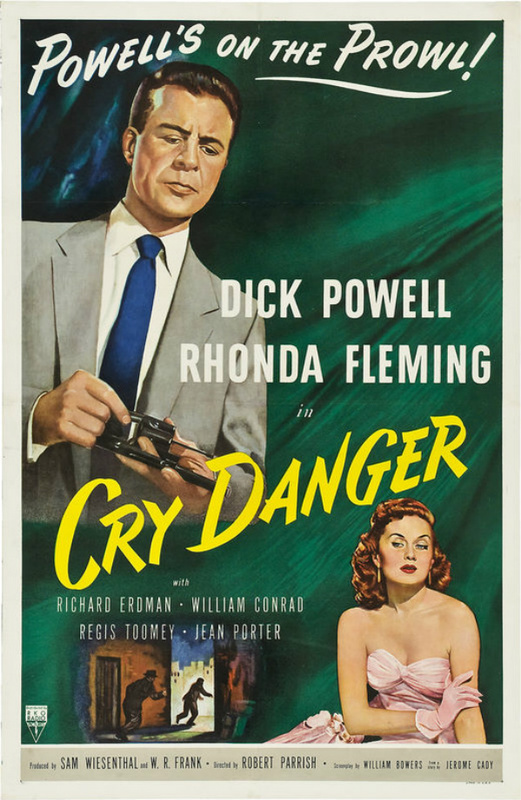 Cry Danger contains a slew of familiar noir elements: world-weary anti-hero, the L.A. underworld, female characters with a lotta depth, double crosses, gunplay, etc. But there’s also loads more humor than one typically finds during the classic noir period. The verbal sparring between Mulloy and everyone he comes in contact with is relentless. This makes the film fine example of noir going beyond the mold its golden decades often adhered to. The cinematography by Joseph Biroc (who’s most well-known for shooting It’s a Wonderful Life) offers some striking shots around the Bunker HIll area of Los Angeles. The most stunning sequence shot in the film is certainly the opening moments, when Mulloy arrives by train into Union Station and proceeds through its shadowy tunnels. Right there from the get-go we know we’re entering an underworld with Mulloy as our guide. A great beginning to a damn good film.